The purpose of this topic is to provide information that isn't already provided on the official announcement and to keep you up to date on the development of transformice adventures. Transformice adventures is a new game that will be released by atelier801, the release date is still uncertain because it is still very early in development. However the Kickstarter will likely be released in the near future. It is free to play, made in HTML5, and set to be released on all computer platforms (Windows, OSX, Linux) and mobile. You will be able to log in with your already existing atelier801 account. Disclaimer: Due to Transformice Adventures still being very early in development, aspects of the game can change at any given moment. 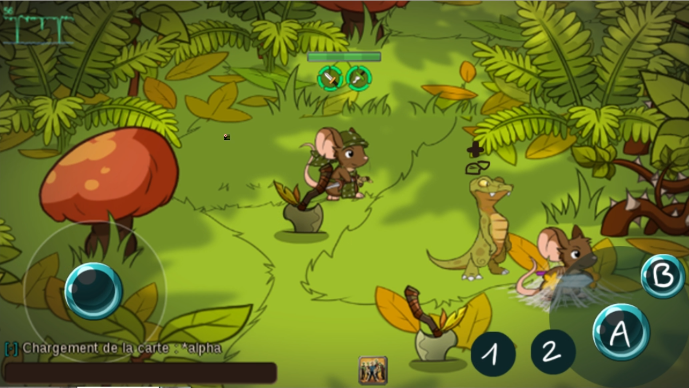 Transformice Adventures is a multiplayer action-RPG set in the world of Transformice, featuring combat and exploration.You will be able to explore dungeons with your friends, encounter fun diverse groups of monsters, loot, and improve your gear. Transformice adventures will mainly be a PVE type game. 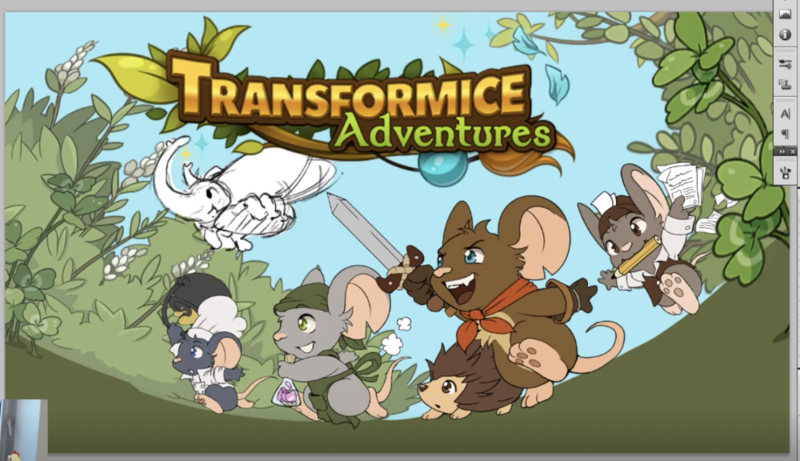 The demo of transformice adventures will not support PVP but it is very possible it will eventually get implemented into the game once it is released. Transformice Adventures will not be an open world or a scroller. Completing the main storyline does not mean the game is over. It is very likely that there will still be quests and gear to aquire once the game is over. 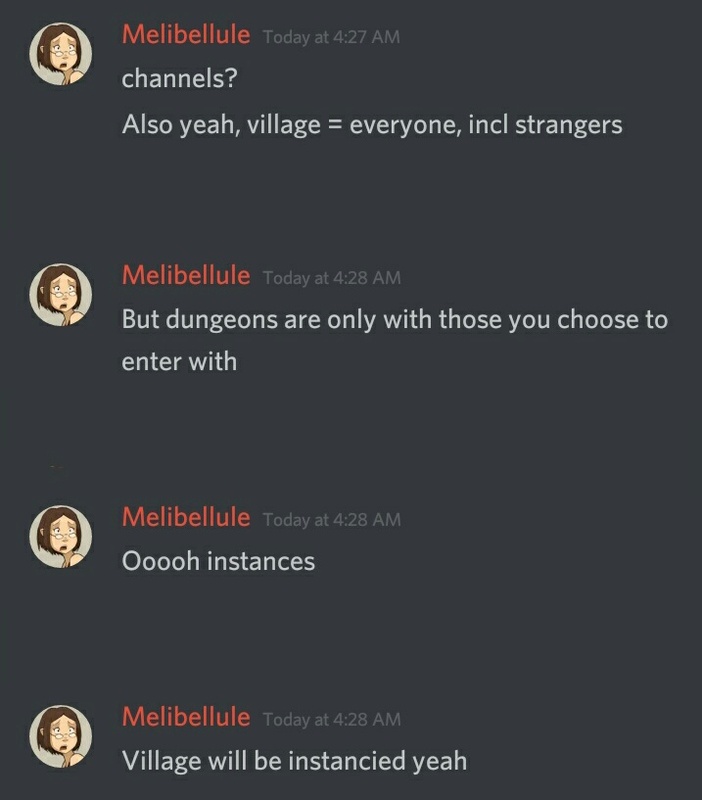 Melibellule has confirmed that there will be something similar to an endless dungeon mode. According to Melibellule, the game leans more towards a mission based game, rather than an open world type game. It will mostly be traveling back and forth between the village and mission location. There will also be a party system similar to deadmaze. 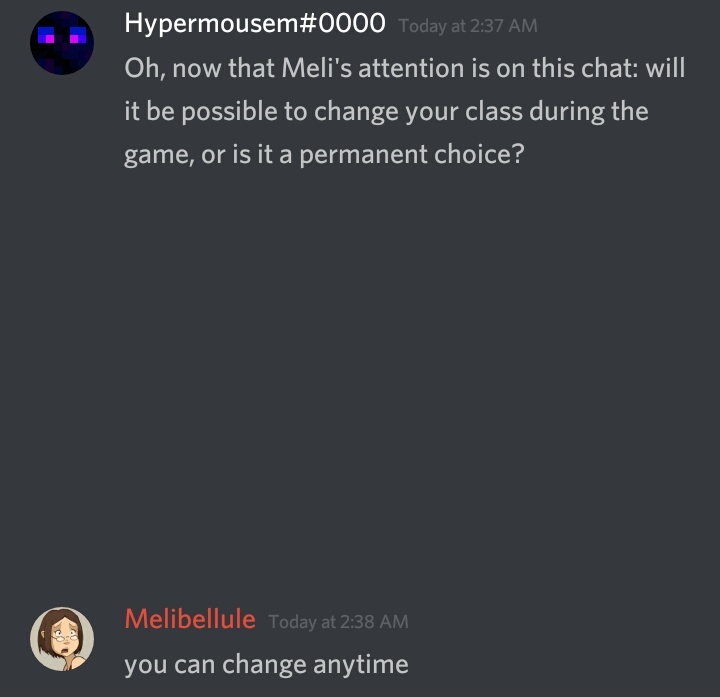 Although it hasn't been officially stated yet, Melibellule has confirmed that classes will be a part of the game. Melibellule has stated that regular classes such as warrior, mage, or healer will not be in the game because it is "boring". Melibellule has confirmed three classes as of right now, which are Chef, botanist, and a journalist. You can also put various ingredients into the pot. 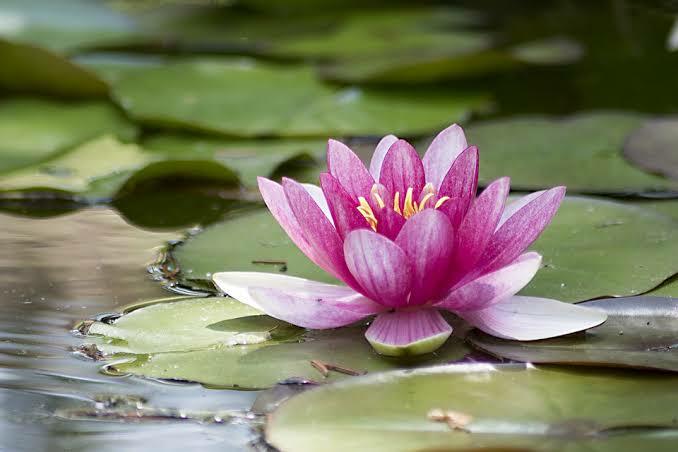 Classes are not permanent, you are free to change your class anytime you'd like. Transformice adventures starts right after Elisahs statue was destroyed and Berta flew away. The two main characters that we know will be in the game are Berta and Mirolle the priestesses sisters. 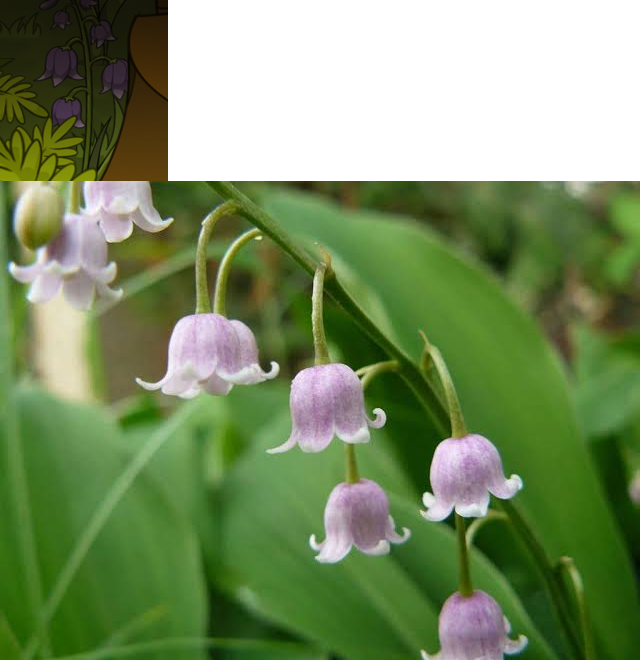 They will both appear as NPCs and you will mostly be accompanying Mirolle in your adventure. Melibellule has also stated multiple times that shamans will also play a huge role in the story. 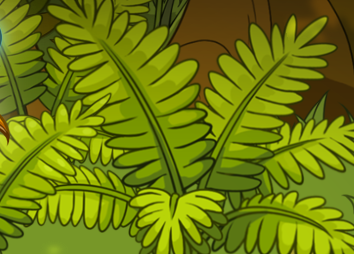 You can even see shaman feathers and a shaman tailpiece in the transformice adventures title. 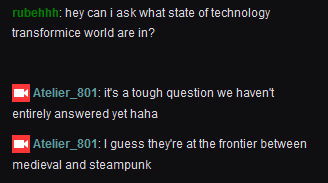 Melibellule has confirmed that Transformice Adventures technology is about as advanced as steampunk and medieval. However this does not mean that it takes place in medieval times. 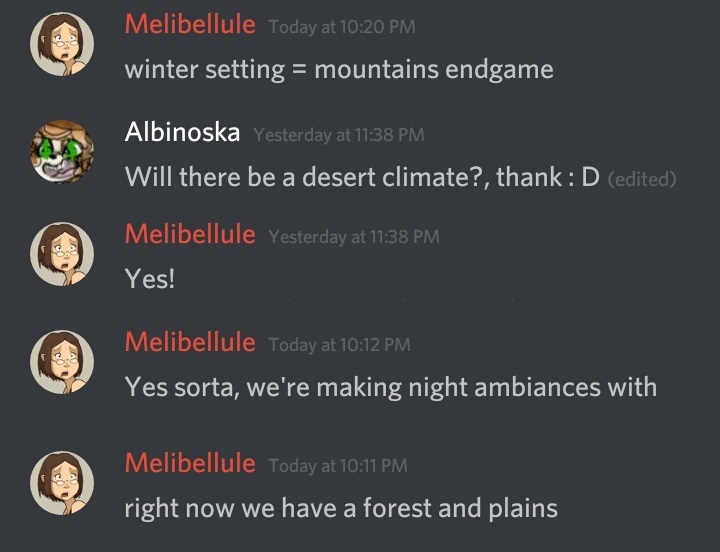 So far the biomes in transformice adventures that we have seen are a village, plains, and the forest (and possibly a pond), but Melibellule has stated that there will also be a desert climate, a village filled with scientist mice (it is very likely that there will be multiple villages), and a mountain/winter biomes which is where the end game will take place. 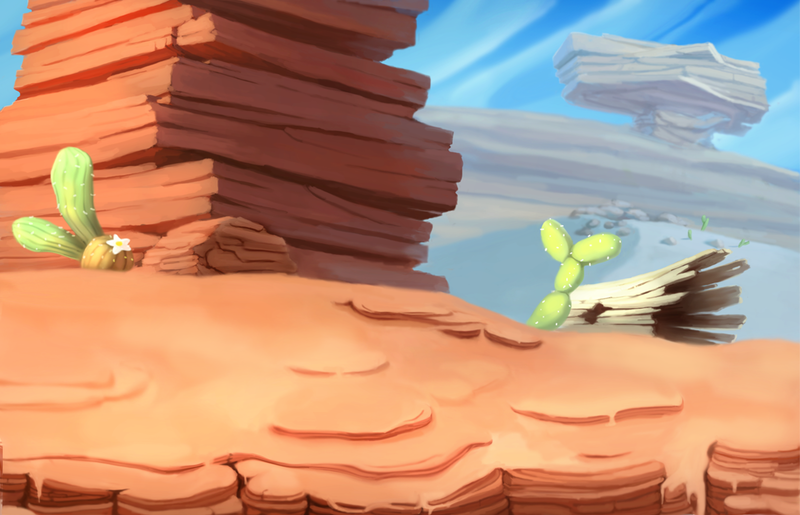 An example of a desert climate has been pinned on the discord #suggestions channel. 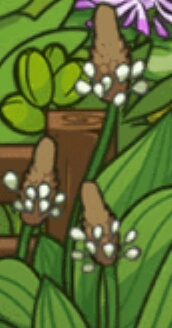 Just like transformice, you move your mouse with the "wasd" keys. You do not move your mouse by clicking on the map. From what we have been shown, it also seems as if there is no enemy lock on, so your attacks need to be precise and accurate. Your mouse will always be in the middle of the screen so it is unlikely that you can move your view freely. 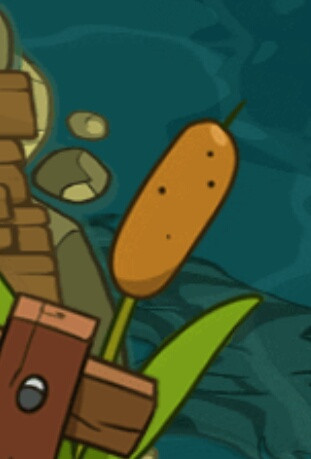 It has been officially stated that transformice adventures will have pets. As of right now, you can equip gear and hats on your pets. Pets will assist you in battle, Melibellule stated that pets can either give buffs, heal, defend, or attack. You can only equip one pet at a time. Pets will play a big role in the game. Pets will also have it's own AI. Melibellule has also stated that almost every enemy you encounter, will be an enemy. A player named Nuttysquirell#0626 composed music for the game and submitted it to the discord #suggestion channel, Melibellule pinned the music and said it will fit for the transformice adventures title. This implies that the transformice adventures music will have a similar style. 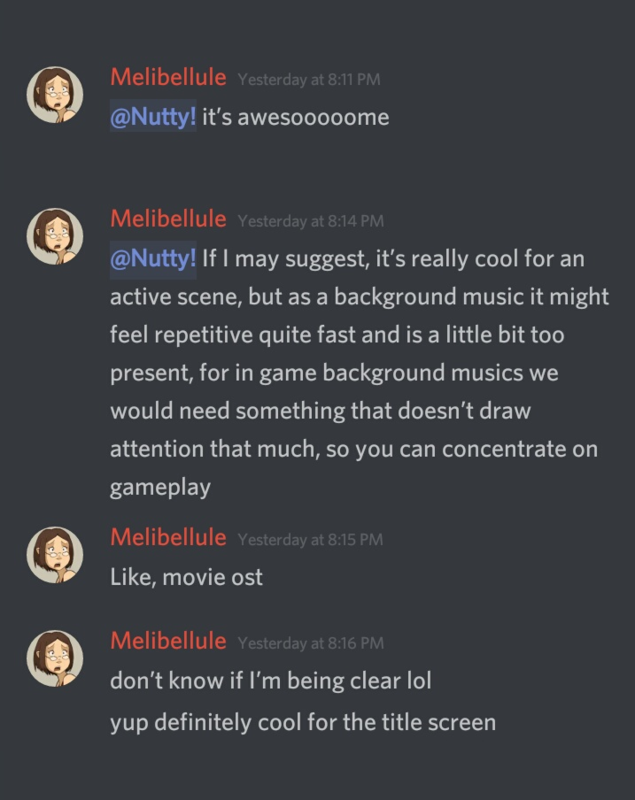 Melibellule also said that the in-game music will be less repetitive, more subtle, and be more like a movie ost. 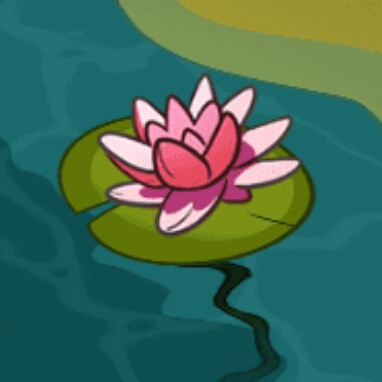 Transformice Adventures will also have ambient sounds. 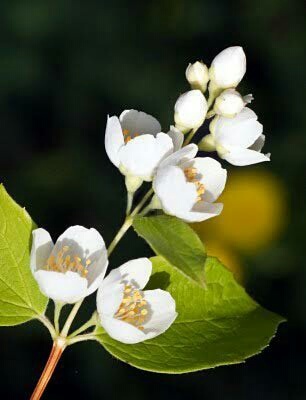 Example: wind, leaves on trees, etc. So far Transformice Adventures has not had titles coded into the game yet and will not likely be in the games demo, but it might be implemented into the full release. Due to mobile limitations, it is most likely that each class will have only have around 3 choices of attacks. This problem might be resolved in the future and classes will have a wider range of attacks to choose from. However, this most likely does not mean you cannot upgrade/evolve your attacks as you progress further in the game. Transformice Adventures will have an entire new and interesting combat mechanic. Melibellule has confirmed that it will not be as simple as attack and defense. There will be healing, poisoning, skill bonuses, and synergy between classes. It is still unclear as to what Melibellule meant by synergy between classes, but it is possible that you will be able to combo attack, skills, etc with other classes. Pets will also assist you in combat, and there will also be buffs and debuffs. Shields have also been confirmed. 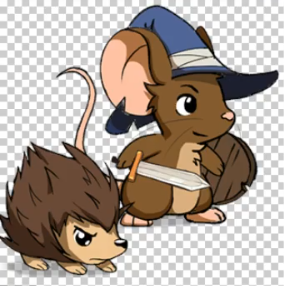 In Transformice Adventures you can aquire gear for yourself and for your pet, although it is still unclear as to what gear does in the game, it will most likely boost your stats during battle. Gear can also be improved, this can probably be done by looting your enemies and getting money to buy at a gear shop, or collecting certain materials to craft better items. Enemies that you will often encounter in the game will be monsters. We have already seen a spider monster, but Melibellule has confirmed that there will also be a bee enemy. Different types of monsters can be encountered in different types of biomes. 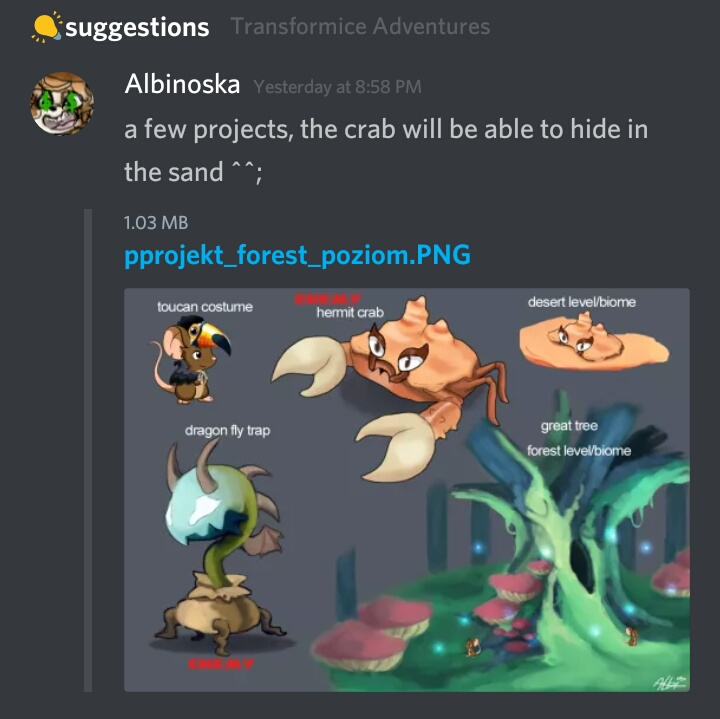 It is also likely that there will be a hermit crab monster in the desert biome or a dragon fly trap in the forest, an example of this monster has been pinned on the discord #suggestion channel. There will most likely be multiple villages. Melibellule has confirmed that there will be a village filled with scientist mice, and the villages/biomes will be relatively large. According to the official Transformice Adventures announcement, the village will also be a place to chat and meet up with other players. It is very likely that NPCs will have their own purposes and will mostly be located in the village (similar to the transformice NPCs). Example: there might be a clothes vender, blacksmith, fisherman, etc. (This might be the reason as to why the village will be so large.) 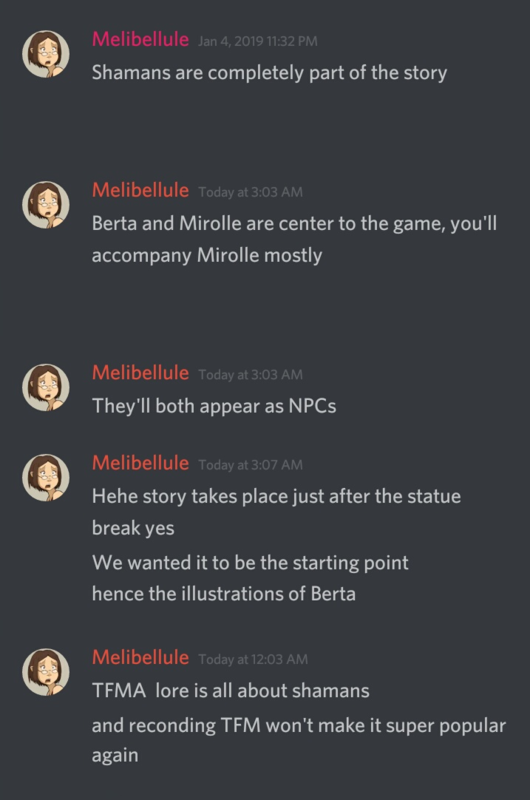 Berta and Mirolle have already been confirmed to be NPCs by Melibellule and creating your own NPC will be one of the perks of supporting the game. Melibellule has stated that the village will be filled with random people (similar to the transformice village). According to Melibellule the village will also have instances (when there are too many players in the village, the village will be duplicated). However, you will only enter dungeons with players in your party. These skills were actually leaked a while back but we were unsure if it was allowed to be shown, thankfully the admins didn't seem to mind if the skills became public. This is a list of the skills that will almost certainly be added to the game. Effect: Electrical damage suffered are reduced. Reduced damage is added to the next attack. Every 3 shots, the target is stunned. Effect: The arrows pass through an additional enemy. Effect: Affected enemies take additional physical damage as well as being immobilized for 5 seconds. Effect: No longer deals damage to enemies but healing is increased. Trading has been confirmed to be a part of the game. Melibellule has stated that there will not be a trading place/marketplace, but you will be able to trade in the game. It is still very unclear as to what trading will be used for. Like almost all Atelier801 games, it is very likely that tribes will be a part of the game. 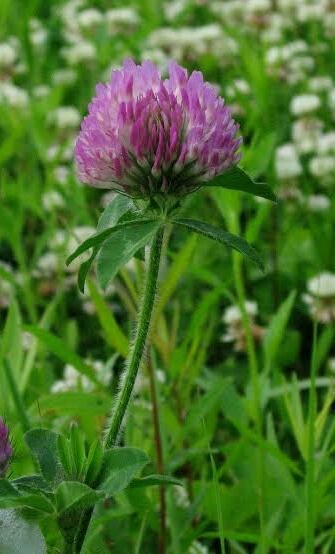 Melibellule has also stated that tribe houses might be a part of the game. 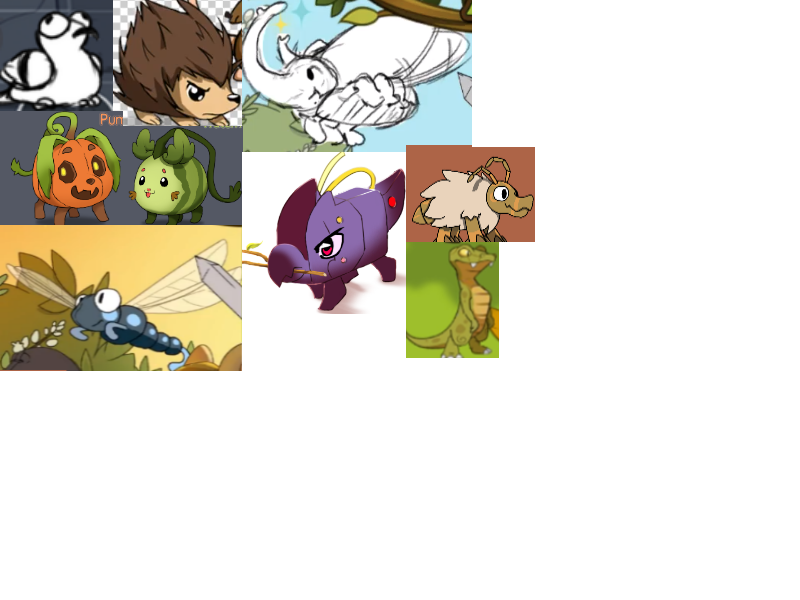 It is very likely that tribes will be the similar to Transformice tribes. 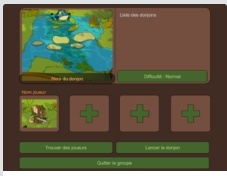 To create a tribe, it is most probable that it will use the Transformice Adventures currency. Melibellule has confirmed that there will be weather changes in Transformice Adventures. Melibellule has stated that light rain might be added into the game. Melibellule has also confirmed that there will be a day and night cycle (this can be seen in one of the sneak-peeks). 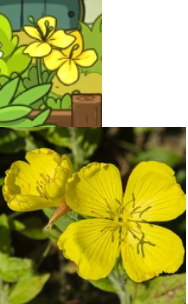 It is shown in one of the sneak-peeks that the emojis in Transformice Adventures will be the same as the emojis in Transformice. There will be 10 emojis in total. Similar to the shaman indicator, a circle of icons appears at your current mouse position. You can then select the emoji you wish to show. According to Melibellule the Kickstarter campaign will start in a few months, but still happen in the first half of the year. And it is very probable that we will receive lots of information about the game. The perks from supporting the game that we already know of are receiving early access to the game and the ability to create your own NPC. There will also be a free demo before the Kickstarter. Something big might be revealed before the end of this month. Danny leaked that the "translations" of Transformice Adventures will be revealed before the end of the month. Melibellule confirmed this by saying "it's kinda rude to leak our Dms." It is still unclear as to what exactly the translations are for, but it will likely give us much more information and details about the game. This tab is not fully finished yet, we still need some more time to finish our theories or there is still not enough sufficient evidence. Once a theory gets confirmed/has enough sufficient evidence it will be moved to the Information tab. This image was leaked on the Atelier801 twitch stream. We will analyse it piece by piece. In the top left of the image you can see a green line graph and the number 56. It is very likely that the number 56 is the amount of frames per second being displayed. The green line graph seems display fps drop. FPS drops may happen due to the map loading, mice attacks, chatting, opening inventory, etc. On the bottom left there is an analog, this is used to move the mouse around the map. On the bottom right corner of the image there are four buttons. It is very probable that the function of the A button is for using attacks that require the player to aim. This would explain the circle around the A button. The function of the B button is still very unclear. It could be used to equip/put away your weapon (you can equip/put away your weapons at will, which will also cause the expression of your mouse to change), open your inventory, secondary attack, or maybe even a combo (similar to deadmaze). It is very probable that the buttons 1 and 2 function as the mouses skills (it is very likely that the skills for each mouse may vary depending on the class). On mobile, the chat will be located in the bottom left of the screen. Above the chat box, there is some text that translates to "Loading the map: *Alpha" This text could either be from the players, or from the game (similar to transformice when you type /ping). This also confirms that the chat text will not have a background, and the text will just appear above the chat box. It is likely that the text will then fade away after a certain amount of time. It is also likely that you will be able to see the full chat f you press the chat box. 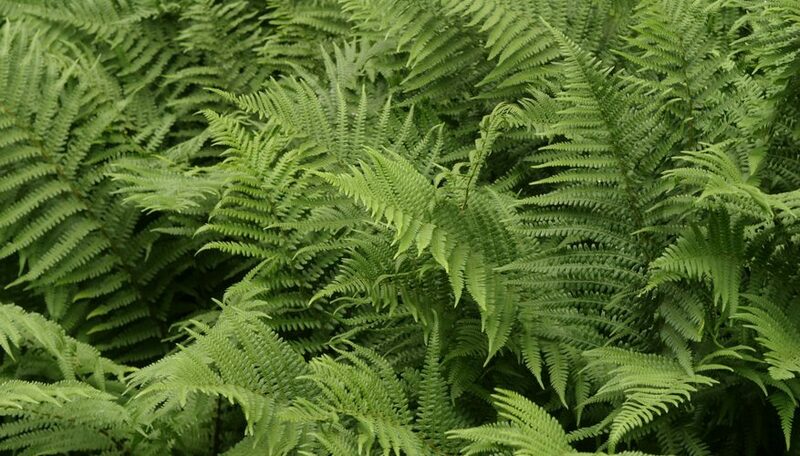 It is very likely the locations of this screenshot is in the forest biome, due to the fact that many of the plants are similar, although there are a few new types of plants. 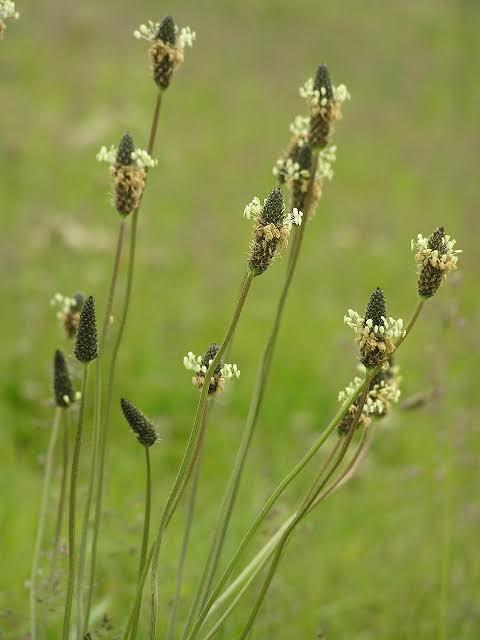 (New type of mushroom, new thorn plant, etc. 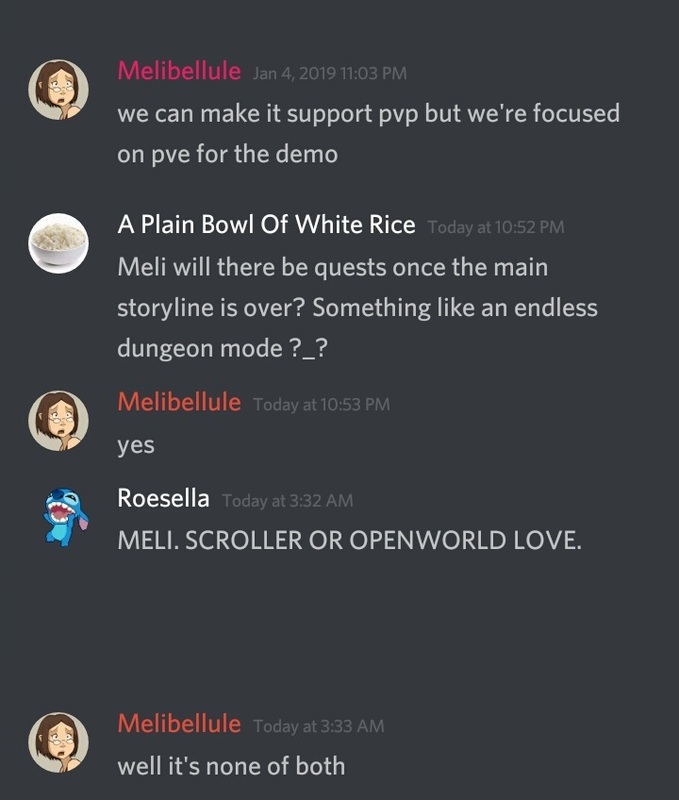 Melibellule has also confirmed that the game is not a scroller, so it is very likely that the map will have many twists and turns instead of one linear path. Next to the mouse in the bottom right of the image, there seems to be a pet lizard. There seems to be something floating above the pet lizards head. 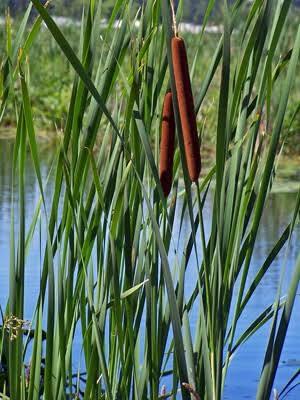 It is still very unclear as to what it is. Some possibilities are: it is an indicator that the pet is ready to level up, the pet needs food, it is a buff that the pet gives, etc. The mouse on the bottom left seems to be holding a new type of sword (the flower sword) that we haven't seen yet, it is still unclear on how it's different from the previous weapons we've seen, but maybe it has something to do with the thorns seen near the mouse. Another new weapon is the axes on the floor. It is very unlikely that this is a weapon due to the fact that is has a shadow. All of the attacks we've seen do not posses any shadows, so it is likely that the axes are part of the background/mere decorations. As we can see in the screenshot, there is no split screen when playing multiplayer, this means that the camera will only follow your mouse around, and your friends can go off screen if your far enough from them. There are a few things above your mouse, there is a green bar (which is likely a health bar and there are two other buttons. It is still unclear as to what the functions of these two buttons are, but a few theories are: these might be used to equip/put away your weapons, open your skill tree/inventory, etc. 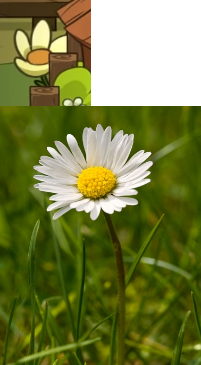 Transformice Adventures contains various types of plants, here are a few plants in Transformice Adventures that we managed to find in real life. Transformice Adventures discord was created at least two days before it was announced/released to the public. This is a list of trivia that does not belong anywhere in particular. We will continuously be updating this topic, so please tell us if you have any additional information or grammar/spelling corrections! Great topic, I'm sure this is gonna be useful for all the people who need to catch up on released game info! This is really good, guys! Meli, confirms that TFMA is not equal to deadmaze! What a cool thread! Good job! This thread should be renamed "The Stalkers' Village: destroying the enthusiasm of fans since 2019"